Wishing for Spring? 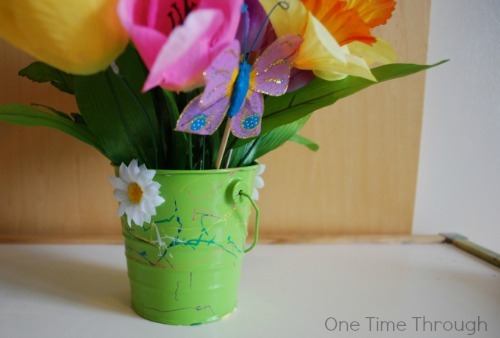 That’s what inspired these cute FINE-MOTOR “SPRING” 3D art and craft projects! 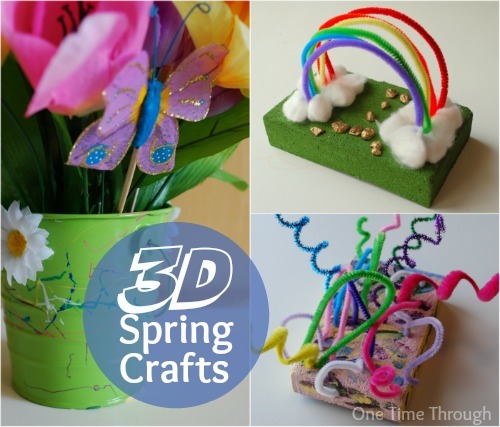 Today we are featuring three 3D art/craft projects that you can try to help celebrate Springtime! All three are super easy to prep for your kiddo, cheap to make, and great fine-motor practise for your child. They are also really cute and will brighten up your bookshelf or kitchen table! This post contains Amazon Affiliate Links. Please see our Disclosure page for more details. Onetime was so proud of this cute little rainbow he made for St. Patrick’s Day this year. Dad was home this March Break and he wanted to keep “showing it off” to him! Cute! You Will Need: pipecleaners that are R,O,Y,G,B,V, some cotton balls, white glue, florist’s foam, and little gold stones, or regular stones your child can paint gold. 1. With a marker, mark 6 dots in a line on each side of the foam. Show your child how to stick one end of the pipe cleaner into the dot and then help them find the opposite side dot. You can let your child decide the colours – or talk to them about the order of the rainbow colours like we did. Not as creative, but why not add a little science in? 2. 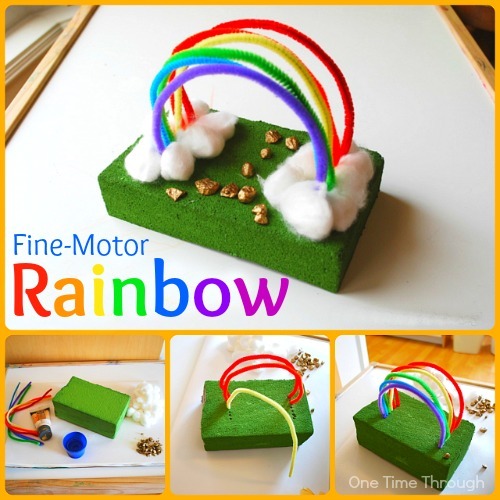 Have your child squeeze glue around the bottom of the rainbow and stick on the cotton balls. This was great fine motor learning too! Onetime couldn’t understand at first why the glue didn’t come out until you turned the bottle upside down! Glue down the gold nuggets as well. We were going to have a little “pot of gold”, but Onetime was done by this point. You could use a section from an egg carton and paint it black for a pot, or the top of a coffee creamer container would work too. 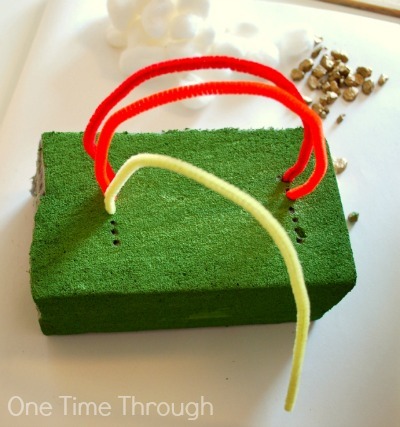 Onetime really liked this project and the next day, when he saw the leftover foam and pipecleaners – he wanted to play some more! 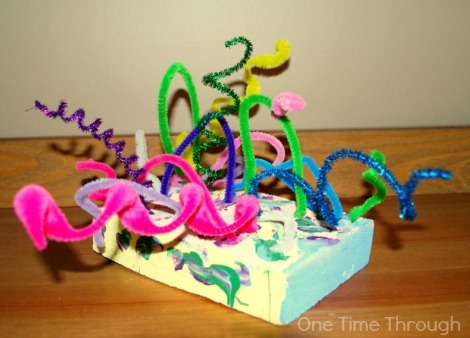 SO….he created the abstract 3D piece below. 1. 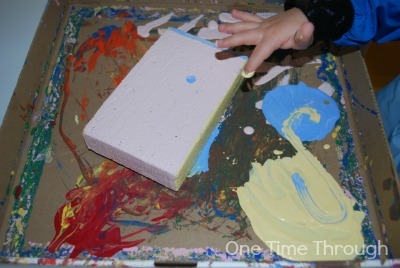 First, Onetime finger painted the block with a variety of acrylic paint colours. I had done a base colour of pink first. 2. After it dried, I gave him a bunch of different coloured plain and sparkly pipe cleaners cut into different lengths and let him go wild! Onetime started off creating little rainbows, and then began to experiment. When I showed him how I had made a coil with one pipe cleaner, he wanted to do that. With me holding one end secure, Onetime was able to wrap pipe cleaners around markers to create more springs. He decided just to stick these in at one end and VOILA!!! “Spring” Art! 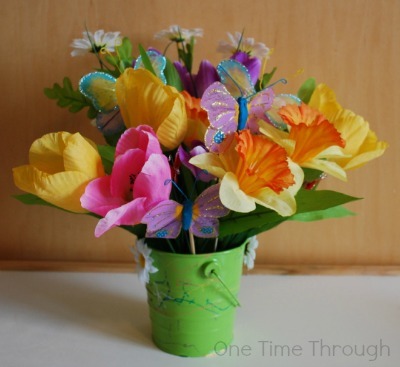 This craft was done in two parts: first the bucket, then the flower arranging. 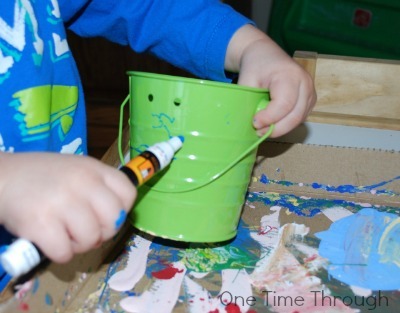 To decorate the bucket, Onetime used acrylic paint markers. They are fantastic for drawing and creating painted crafts with little mess. We did it in stages. Onetime drew on the pail with one colour, then we read a book, then he did the second colour and we vacuumed, then the third colour etc.! When the colours were all done, we used a glue gun to add some daisies on the sides. Then it was the fun part! 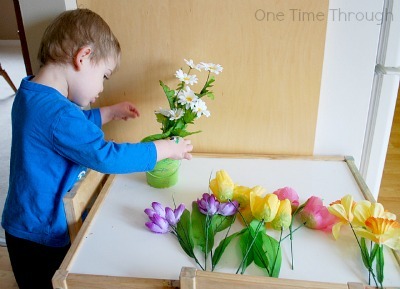 Onetime had a great time choosing where each flower would go! It was really cute watching him take his time to decide and pushing each stem into the foam. So, where does the Science come in? While Onetime was arranging, we talked about the different kinds of spring flowers (daffodils, tulips, crocuses and daisies). We also discussed butterflies and how they feed on the nectar from the stamen in the blossoms of certain flowers. I showed Onetime how to roll the pick with the butterfly on it between his palms to make it look like it was fluttering and we had a few minutes of pretend butterfly feasting! Hope you give these projects a try and enjoy them as much as we did!